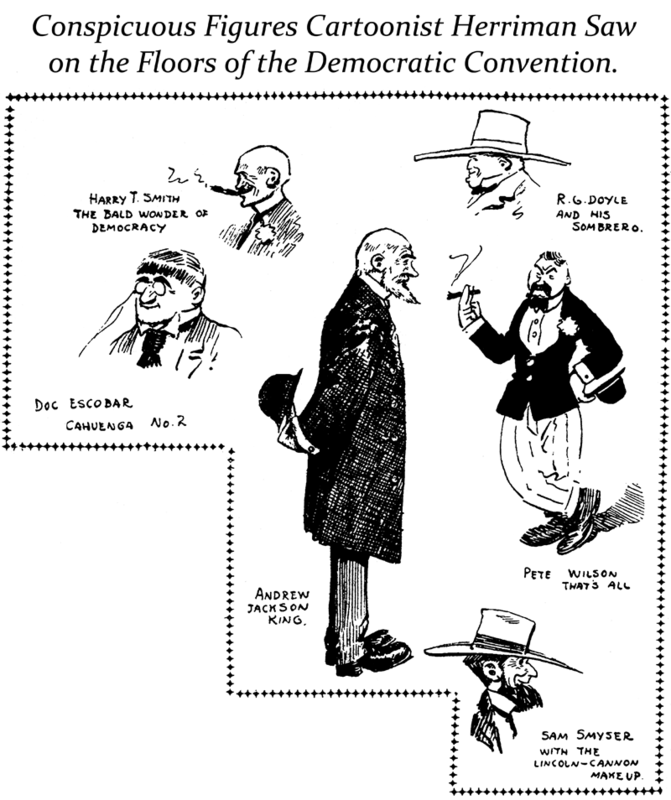 Sunday, May 10 1908 -- I think Herriman left this local Democratic Party meeting early. His sketches of the attendees, at which delegates were selected for the national convention, indicates that he saw little of interest. A couple quick sketches of the more picturesque in attendance and he skedaddled outta there. After Herriman bowed out things got more interesting. Some sort of feud boiled over between a pair of members. As nominations were made for new vice presidents of the club, one nominee was accused of not upholding the ideals of democracy. The accuser became the accused as he was in turn charged with being a gambler. Sparks really flew, with lots of yelling and threats of violence. Great fodder for a cartoon had Herriman just stuck around.